This pink flask is perfect for a girls night out. Fill it up with six ounces of your favorite drink and sit back and relax with this flask. 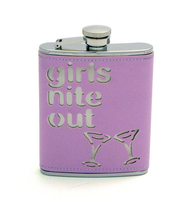 The Girls Nite Out flask makes a great gift! This unique pink stainless steel flask is perfect for a girls night out. Fill it up with six ounces of your favorite drink and sit back and relax with this flask.